Resistivity is a form of geophysical survey based on the passage of an electrical current through the ground at regular points within a survey grid. Electrical resistance in the soil varies, and can be affected by the presence of archaeological features as well as natur al features. The patterns of resistance in the soil are recorded, plotted and interpreted using special equipment. Electrical currents are conducted through the soil by mineral salts contained in water - the level of resistance is therefore related to the moisture in the soil. The current does not pass in a single direct line between the positive and negative electrodes, but fans out to form a zone between them that can be several metres in depth depending on the quantity of electrical charge. In archaeology, readings are generally less reliable below a depth of about one metre. The method uses a resistivity meter, together with a frame with two metal probes (electrodes) that point downwards, 50 centimetres apart along the base of the frame. These are inserted into the soil at a one metre pitch in a 20m x 20m grid. A brief pulse of weak electrical current is passed between the probes and the level of resistance (measured in ohms) is recorded on a data-logger incorporated in the meter. These readings are later downloaded onto a computer and interpreted with a graphics programme to produce a bitmap or plot of the resistance patterns across the survey area. Areas of high resistance may indicate a wall, for example, whereas low resistance may indicate a ditch. Similarly, regular features suggest human intervention. As can be seen from this example of a 20 x 20 metre grid at Low Grounds over a quadrant of a Bronze Age barrow now invisible on the surface, hidden features can be revealed. 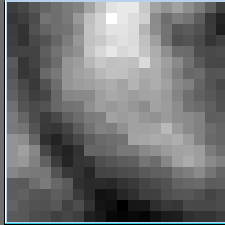 Each pixel is a metre square and the shades of grey show relative moisture: darker more moisture and lighter less. Of course, modern features such as pipelines may show up also, so it is important to find out about what may be buried before starting a survey. As in the case illustrated, the information may be sufficient to confirm the existence of a suspected feature and allow interpretation of the site. Alternatively it can be used to complement other geophysical data, for example from magnetometry, or to target the location of excavation.